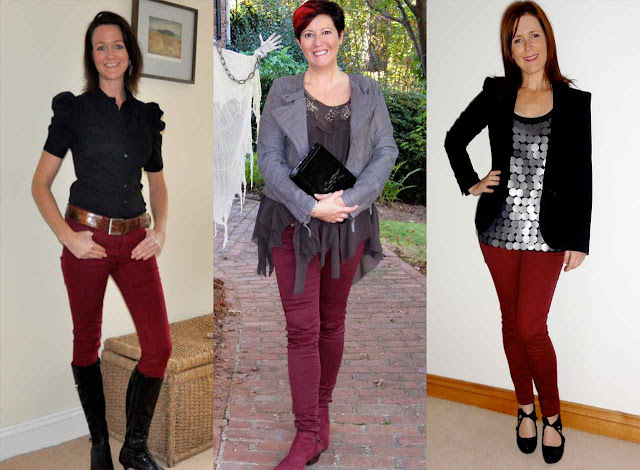 So excited to bring you this joint post with Joanna at Poppy's Style and Fiona at Avenue 57…all about this season's must have - burgundy jeans. I love when bloggers get together in these sorts of posts - hope you do too..always interesting to see what everyone styles up. I promise we didn't share our outfit ideas before we took the photos! We've all blogged about a daytime and a going out outfit so once you've checked mine out, head over to Joanna's and Fiona's blogs to read more about theirs. My daytime look is all about the grey - have you noticed my grey obsession yet?! I know I said I'm favouring my ankle boots this winter but the truth is these jeans are ever so slightly too short so they work better with long boots. I'll be honest with you and say don't get your burgundy jeans in H&M - the fit is not that good and they shortened significantly when I washed them the first time. I recommend Gok's ones at Sainsburys - they are a much better fit and come in different lengths. For my night look, I mixed my burgundy with black and grey and I love how the burgundy jeans brighten up the whole look - such a nice change from the all black that can be so easy to throw on for a night out. And here's the montage of all our evening looks..don't we scrub up well?! I hope this has inspired you to work some burgundy into your wardrobe this season. Make sure you take a look at Poppy's Style and the Avenue 57 blog to read more about what Joanna and Fiona are wearing in their photos. Was really nice to work with you and I am really inspired by the evening look here - I am thinking of adding my blazer to my burgundy jeans for a casual meeting in the future .. makes a change from my dark denim skinny jeans! Weirdly I have just got my burgundy jeans out to wear tomorrw. Wearing with a bright pink oversized jumper and a patterned scarf. I love them!! You have such a grey obsession Avril, but I love it! THANK YOU!! How perfect is this blog post for me? My mum has just sent me 2 pairs of skinny jeans - a burgundy and forest green pair arrived in the post yesterday. I have been thinking about how I can wear them for a night out tomorrow and you have provided the perfect inspiration I needed! You rock! Oooh I have a pair of burgundy skinnies I've not worn yet, must get them out! Great timing for this post! Love how they brighten up an outfit ! I don't have any burgundy skinnies - just damson chinos. 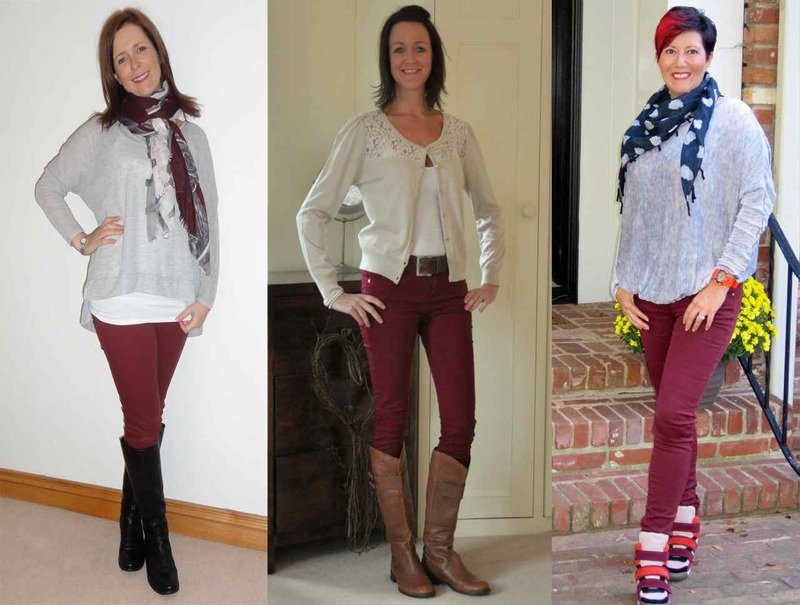 I actually find burgundy skinnies a little scary - something to do with the tightness and the thought of carrot legs - I rarely team skinnies without boots. I did a reverse of you in my current post, I did burgundy top with grey bottoms - my offering seems very tame compared to you three gals! All look great and so different. I love seeing how one person takes an item and wears it so different to the next. That outfit looks really stylish on you. i am getting more confident at mixing new colours thanks to your blog. So please keep blogging-it is greatly appreciated! Is the Pull and Bear scarf that you are wearing in the above pics exactly the same as the one you have provided a link to? As really like your one and don't want to order the wrong scarf! I was about to ebay mine but maybe will think again. I love the grey too. I have some burgundy jeans and you have given me some great ideas. You all look great in them. I love my burgundy jeans, wear either with grey or navy blue. Never thought of wearing them on a night out. really love it fantastic outfit.